Exp. I: control mice. Exp. 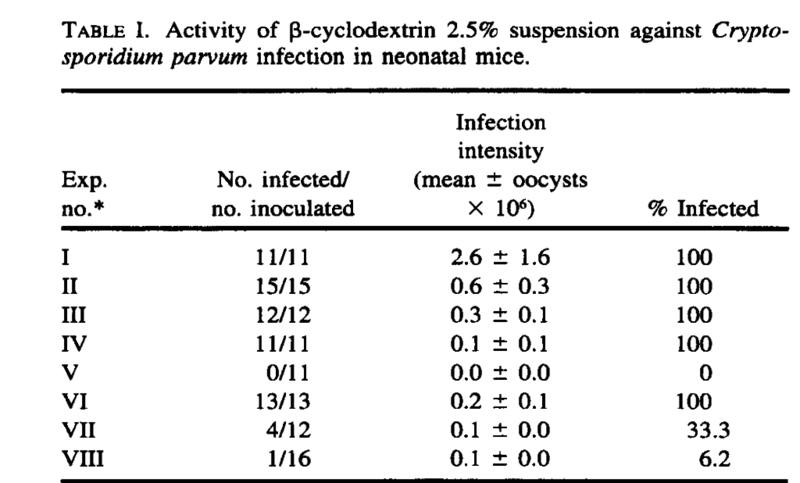 II : mice inoculated with oocysts exposed to a 2.5% b-cyclodextrin suspension for 24 hr. Exps . III-V: preventive efficacy, the products were administered 1 hr (exps. III-IV) or 2 hr (exp. V) before inoculation of mice with nontreated oocysts and on days 1 and 2 postinoculation every 24 hr (exp . III) or 12 hr (exp . IV-V) postinfection . Exps . VI-VIII: curative efficacy, the product was administered on days 3, 4, and 5 postinoculation at 24, 12, or 8 hr (exps. VI-VIII, respectively) postinfection . Compares the exposure of oocysts to a 2.5% suspensions of BCD for 24 hours; one set being a control group not exposed. The infection intensity reduced from 2.6 to 0.6 (x106). The margin of errors did not overlap. In both cases 100% of mice were infected though oocyst output was lower when BCD was used to inactivate the oocysts. Doses of BCD were administered either 1 or 2 hours prior to challenge with untreated oocysts. A single dose administered 2 hours prior to inoculation was superior to a 1 hour of separation when treated every 12 hours. A two hour period of separation and then treated at 12 hourly intervals on day 1 and 2 after dosing, gave optimal control with 0 % becoming infected. However a 1 hour separation was sufficiently long for 100% of mice to become infective. When given for 3 days 3, 4 and 5 days post inoculation, there is a lowering of infectivity especially for dosing at 12 hourly or 8 hourly periods, but not nearly so when admiinistered at 24 hourly intervals even though the infection intensity of oocysts output was lower, all mice challenged were infected. The percentage infected is lower at 6.2% when treated at 8 hourly intervals compared with 33.3% infected at 12 hourly intervals. Message:When infection is established and control is required, a noticeable reduction in intensity of expression of infection is best achieved with 3 times daily dosing, a reduction in intensity of infection and oocyst will be achieved with 2 times daily dosing. And the ongoing treatment in advance of this oocyst output will lead to zero infection when given at regular intervals. The interval of 2 hours is optimal between treatment and subsequent intake of oocysts. The increased effectiveness of 2.5% betacyclodextrin to inactivate oocysts with more time (from 1 hour to 2 hours) prior to infection. More activity with more frequent treatments suggest ‘slugs of betacyclodextrin’ in advance of oocysts load up the intestinal layer with betacyclodextrin (BCD) preventing the adhesive phase of the crypto cycle. Each slug ‘catching more oocysts’ from direct contact or interaction with cholesterol of cellular membranes. It is also possible that time is required for the betacyclodextrin to interfere with the excysting stage. If it was direct contact alone the action would not differ between the different time intervals unless oocysts and betacyclodextrin passed through at different speeds. Other experiments compare different concentration of betacyclodextrin (BCD) to inactivate oocysts with different infection rates reported with varying concentrations. ← EXAGEN – Why Start from Day 1?